With respect to their economies, cities are often judged according to their performances in jobs creation, faster being better than slower, and whether they have low or high unemployment rates. The Tables in this article set out those metrics for the largest (by population) 51 metropolitan statistical areas (MSAs) in the U.S. and 33 census metropolitan areas (CMAs) in Canada. Table 1 ranks U.S. MSAs by year-over-year jobs growth on the left-hand side and unemployment rates on the right-hand side. Table 2 copies the layout of Table 1, except that it is for Canada’s CMAs. As a concept, MSAs and CMAs are essentially the same. They’re urban areas with sizable downtown cores, plus suburbs with close work-to-residence commuting ties. But there are some differences between the U.S. and Canadian data that should be spelled out. First, the U.S. numbers in Table 1 are not seasonally adjusted (NSA); the Canadian figures are seasonally adjusted (SA). The Bureau of Labor Statistics (BLS) chooses to emphasize its NSA calculations for city labor markets, whereas Statistics Canada has long provided SA numbers. Second, U.S. city labor market statistics are a month behind what is available for Canada. Table 1 showcases February 2019 numbers; Table 2 is for March 2019. It’s not that Canadian statistics are always ahead of the U.S. Far from it. For some other data series, − e.g., retail trade data from the Census Bureau, − the U.S. is a month ahead of Canada. Third, Canadian unemployment rate numbers are always biased higher than their U.S. counterparts. The definition of unemployment north of the border is more relaxed. Statistics Canada publishes an NSA unemployment rate, with the technical name R-3, that adopts the same stricter methodology as is employed by the BLS and it’s usually about one percentage point lower than the ‘official’ Canadian rate. 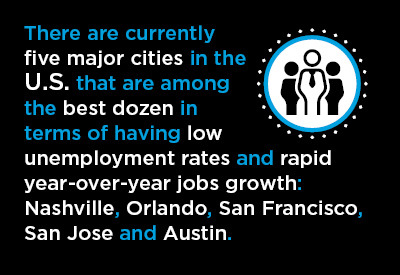 There are currently five major cities in the U.S. that are among the best dozen in terms of having low unemployment rates and rapid year-over-year jobs growth: Nashville, Orlando, San Francisco, San Jose, and Austin. In Table 1, they are the cities shaded in green. In February, there were several other cities that just missed out from being in the elite group: Salt Lake City (ranked 15th for jobs growth and 5th for low unemployment rate); Dallas-Ft. Worth (4th and 19th); Miami (14th and 10th); San Antonio (12th and 13th); and Denver (17th and 10th). Some other cities rank highly according to the one criterion, but then falter in the other. For example, Boston has an exceptionally low unemployment rate and ranks 2nd overall among all 51 centers. But its weak performance in employment growth, only +0.4% year over year, has placed it way down the table on that score, with a 46th place ranking. Green shade: Cities that are in the Top 12 for both high employment growth & low unemployment rate. There were 5 in February: Nashville, Orlando, San Francisco, San Jose, and Austin. Based on not seasonally adjusted (NSA) data. / Cities are metropolitan statistical areas (MSAs). When the ranking numbers are the same, the cities are in a tie. Three Canadian cities comprising a next tier below those at the summit in March were: Hamilton (19th for jobs growth, but 3rd for unemployment rate); Saint John, N.B. (1st and 21st); and Oshawa (9th and 14th). The big percentage jump in employment in Saint John has been on top of a low base, as reflected in the city’s still mediocre jobless rate (5.6%). Oshawa’s strength is in defiance of General Motor’s announced closure of auto assembly operations in the city. Orange shading = Cities that are in the Top 10 for both high employment growth and low unemployment rate. There were 3 in March: Guelph, Kitchener-Waterloo, & Brantford (all in close proximity). Based on averages of latest three months, seasonally adjusted (SA) data. Cities are census metro areas (CMAs). Data source: Statistics Canada Table 14-10-0294-01. Graph 1 shows current unemployment rates in major U.S. cities, with the top half of the chart reserved for the stars (e.g., cheers for Nashville) and the bottom half pointing out the laggards. The labor markets in five U.S. cities are presently having an especially rough go of it: Pittsburgh, Providence, Hartford, Rochester, and Buffalo. Cleveland and Riverside also have high unemployment rates, but they can take minor solace from their middle-of-the-road increases in employment (each at +1.2% year over year). In Canada, three of the nation’s highest-profile cities rank poorly in a joint-assessment of jobs growth and unemployment rates: Toronto (16th and 28th); Montreal (27th and 22nd); and Calgary (21st and 32nd).